We are one of the most reliable and preferred names in the industry. We have been catering to the diverse requirements of the customers by offering premium-grade and quality assured Demagnetizer and that too at the most competitive prices. Excellent and ultra-modern production facilities help us in delivering the engineer precision Demagnetizer. Our Erich Plate Type Demagnetizers are ideal for tool room use as they effectively remove surface residual magnetism from high speed steel, spring steel, die steel, etc. Before the final dispatch, we test the Demagnetizer on various quality parameters. To demagnetize a workplace (whatever be its length) slide it slowly across the top plate at a low and constant speed or by moving it away from the center of the tunnel where the filed at a maximum. Aperture or tunnel type demagnetizer is suitable for demagnetization of material of very small to very large dimensions. Thick object may be de-magnetized by applying both ends to the demagnetizers. 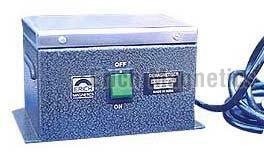 The current consumption is negligible and the unit can be operated from any normal socket outlet of 220 volts A.C 50 Hz. mains. Available Standard Sizes : W- 5" x 6 " and W- 6" x 9"